Rubber Room Ramblings: PERISIAN BREEZE CALENDAR! 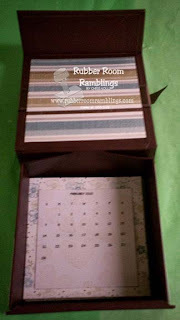 This is one of the magnetic boxes from Stampin' Up! It is the perfect size to hold a little calendar. I decorated it with Parisian Breeze Designer Series Paper, covered a binder clip and added some ribbon to use for the calendar page holder and then I just attached the calendar pages to more Parisian Breeze Designer Series Paper. 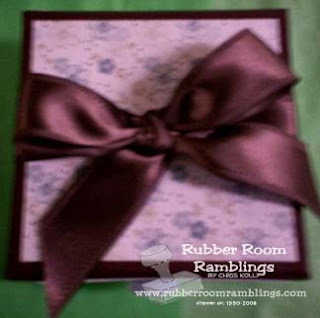 I put the calendar pages and the clip inside the box, added a bow and was ready to rock and roll. 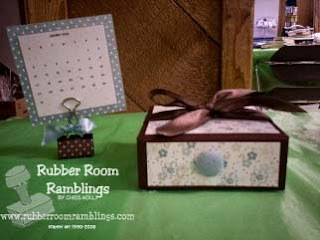 I have been using these as hostess gifts and door prizes, and the recipients seem to really enjoy them!